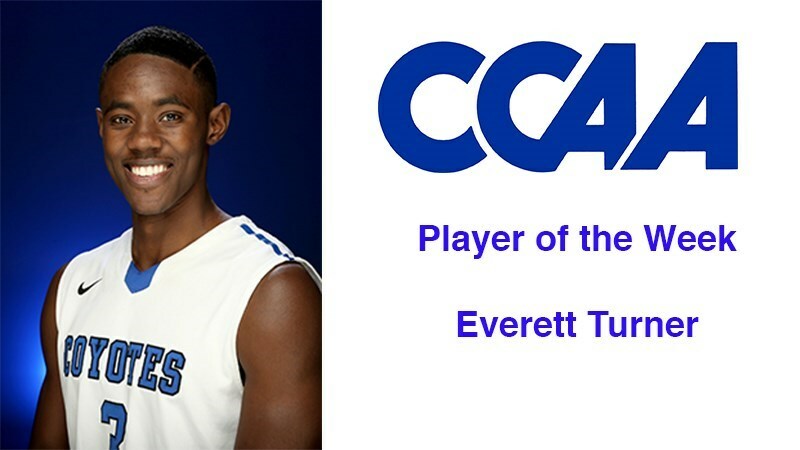 Senior guard Everett Turner of Cal State San Bernardino has been named the California Collegiate Athletic Association Player of the Week for Jan. 16-22. The Colony High School graduate helped the Coyotes to a pair of victories over top-five conference programs, beginning with a 69-68 win over previously ranked No. 20 San Francisco State on Jan. 18. He finished one assist and one rebound shy of a triple double with 12 points, nine rebounds and nine assists, and also had two blocks and two steals in 37 minutes. Then against Cal State San Marcos on Jan. 21, he scored a team-high 23 points on 8 of 10 shooting with five 3-pointers and dealt seven assists as the Coyotes scored their most points in 14 seasons in a 106-100 victory over the Cougars. CSUSB (8-7, 4-6 CCAA) takes to the road this week with games at Chico State (Friday) and Stanislaus State (Saturday).